A couple of Phil Eklund Games. 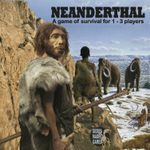 Neanderthal 1st Edition. In excellent condition with cards sleeved. 2nd Edition. In excellent condition with cards sleeved.